Remember when I asked you a little while ago which printable you wanted next? And then I avoided the number cards you all chose and selfishly made some fruit and veggie cards? I promised I was working on them ~ and today they are yours for the printing! 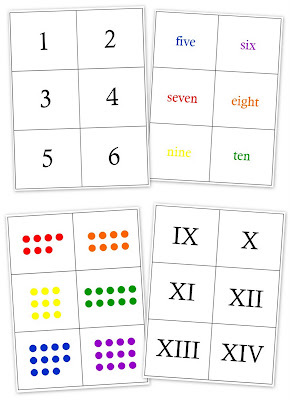 The set includes the numbers 1-20, number words 1-20, Roman numerals 1-20 and also dot cards 1-20. I am loving that I can use these will all of my kids right now: Zachary can work on his number words, the girls can practice Roman numerals more, and Kaleb can start counting 1:1. These cards are designed to help your child identify the numbers 1-20, practice counting with 1:1 correspondence from 1-20, identify number words 1-20, and also learn Roman numerals from 1-20.You can have your child sequence the numbers in the correct order, match the correct number card to the corresponding dot card, match Roman numerals to numbers...the rest is up to you! The full set of cards is available for FREE by clicking on the thumbnail graphic above ~ I promise it's easy! Enjoy! Thank you so much for making these, what a wonderful help. thank you! you're doing some great stuff!! These are great! Thank you so much for taking the time to make these and post them for sharing. Thanks, love these! I'll be posting them on my blog and link back to you if that's cool! Hi! I printed, laminated, and cut these tonight. My boys and I sat down immediately and played some fun games with these cards! So fun!! Thank you so much!! I love your blog and all your helps! btw, I have a Kaleb too! That isn't a common spelling around our area, but I have noticed it is more common around the homeschooling community.